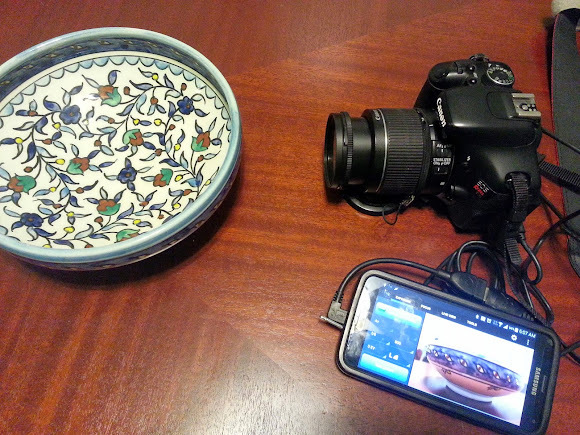 For a few dollars worth of hardware, you can do some pretty remarkable things with the Galaxy S5 and Canon t3i. In fact, any smartphone and DSLR can probably talk in interesting ways, though the combination I happen to have seems to work especially well. Before I jump into the recipes, here's what you may want to buy: USB Host On-the-Go (or just, USB OTG) cable, USB Card Reader and a Mini USB cable (versus the Micro one that came with your cell phone. If you've owned a couple generations of smartphones, you almost certainly have the 'mini' size lying around, as that was the standard a few years ago). This one is pretty dang simple: plugin the OTG cable to your phone, the card reader into the OTG cable, and drop in your camera's SD card. And Bam!, now you've got access to all your photos that you just took with your DSLR. I've been using this as a simple method for previewing the photos before I have access to my laptop. Of course, you can also blog, e-mail and edit the photos once you've gotten them over to your phone. The Samsung Galaxy S5 comes with a built in Ir Blaster which allows your phone to replace the remote for your TV. 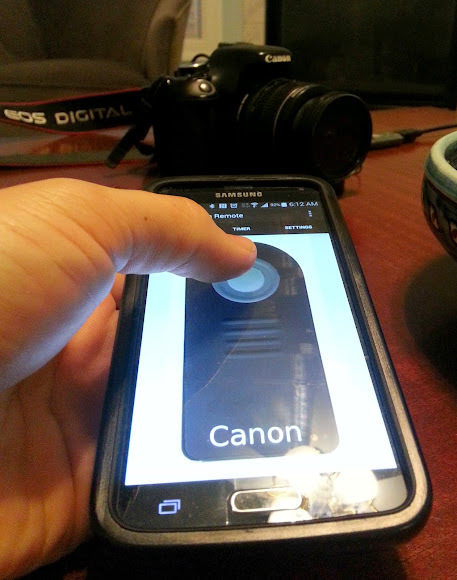 The Canon t3i has the ability to work with a small infrared remote, and using the Camera Remote app, you can simulate this piece of hardware. It's pretty dang amazing, actually. I just selected 'Canon' in the app and set my camera to self timer / remote drive mode. And remarkably, it just works. I point my phone at my camera, click the button and the camera goes off. It's this setup that really blows me away. 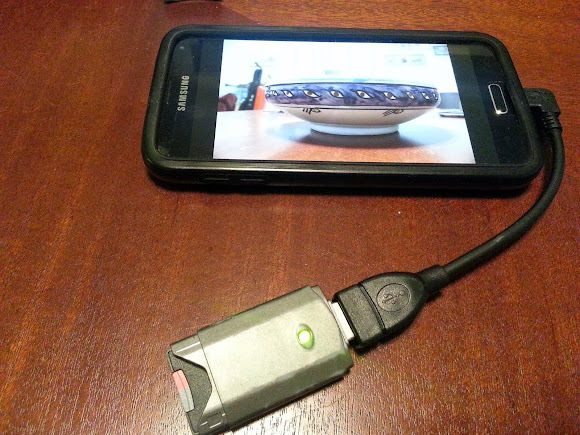 You go ahead and plug the camera into the mini USB cable, the mini USB cable into the OTG cable, and the OTG cable into your Phone. You start up Helicon Remote and all of a sudden your phone is turned into a control center for your camera. Not only do you see what the lens sees, but you can control the exposure, focus and much more. By default, when you snap a photo is automatically downloaded to your phone and cleared from the card. I can't overstate how cool this all is. If I had gone out of my way to buy two more compatible devices, I'd probably have failed. Now, what is this setup useful for? I'm not sure. But definitely something. Certainly if I had my camera on a tripod, I could imagine there'd be benefit to controlling it via an app over the back of the camera.